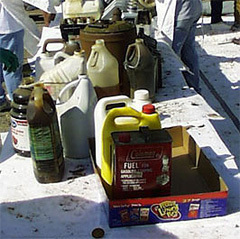 Household Hazardous Waste (HHW) is any material that contains hazardous substances which, when improperly discarded from homes, may threaten human health or the environment. These materials often have Caution, Warning, Danger, Poison, Toxic, Flammable or Corrosive on the label. Examples of HHW includes cleaners, stains, pool chemicals, herbicides/pesticides and oil based paint to name a few. Improper handling and disposal of HHW can result in serious injury to children, refuse haulers, disposal site workers, and fire fighters. Industries follow strict regulation to ensure that humans, animals, and the environment are not harmed. Homeowners need to handle and dispose of HHW properly also. Starting July 5, 2007, the Delta HHW Collection Facility will be open Thursday, Friday and Saturday from 9:00 am to 4:00 pm. Across the street from Goodwill. The facility is closed on holiday weekends.